Comments: A pretty rare SAX, though reissued as Classics for Pleasure CFP 120. 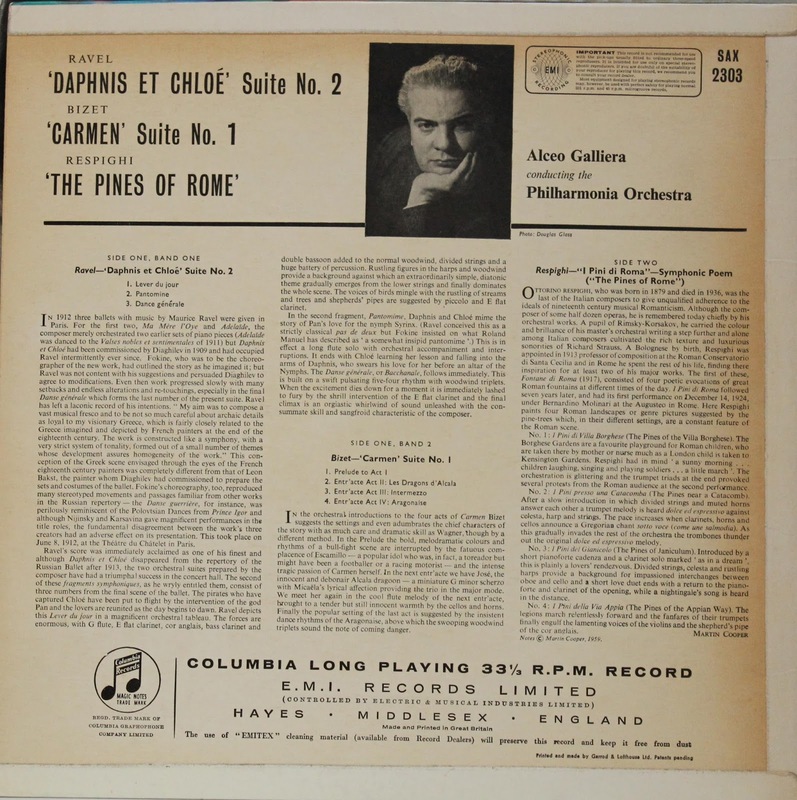 Alceo Galliera was an Italian conductor who lived from 1910 until 1996 and conducted a number of orchestras, including those of La Scala and Saint Cecilia Academy in Rome. 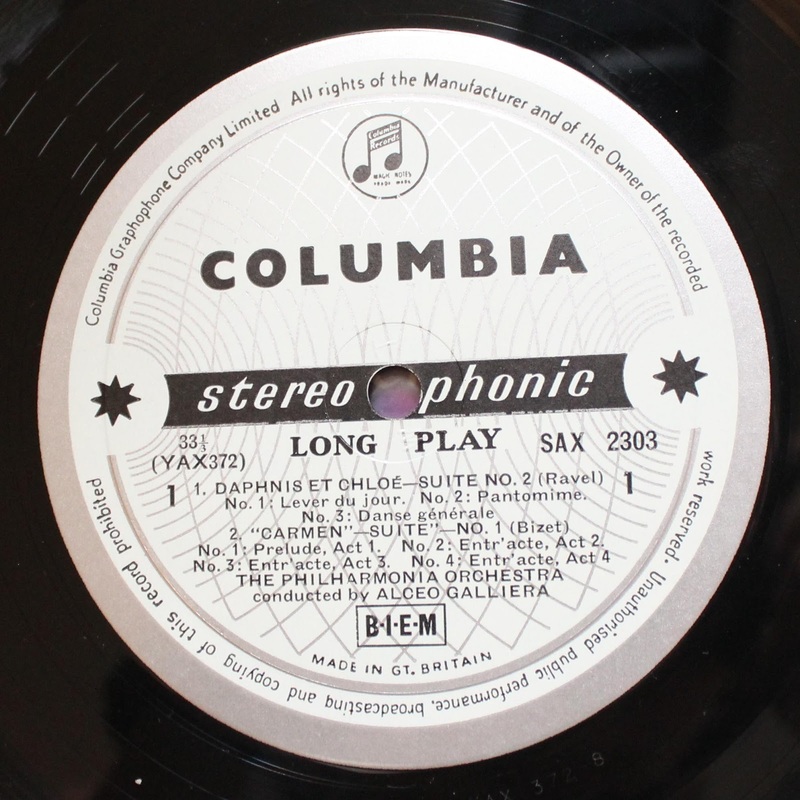 He conducts the Philharmonia on a small number of Columbia SAX recordings. 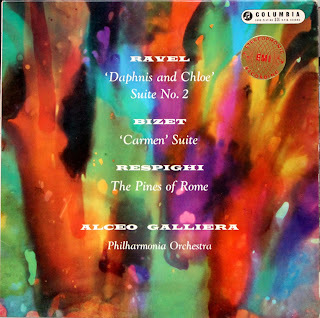 This is another album of orchestral favorites with nice interpretations. 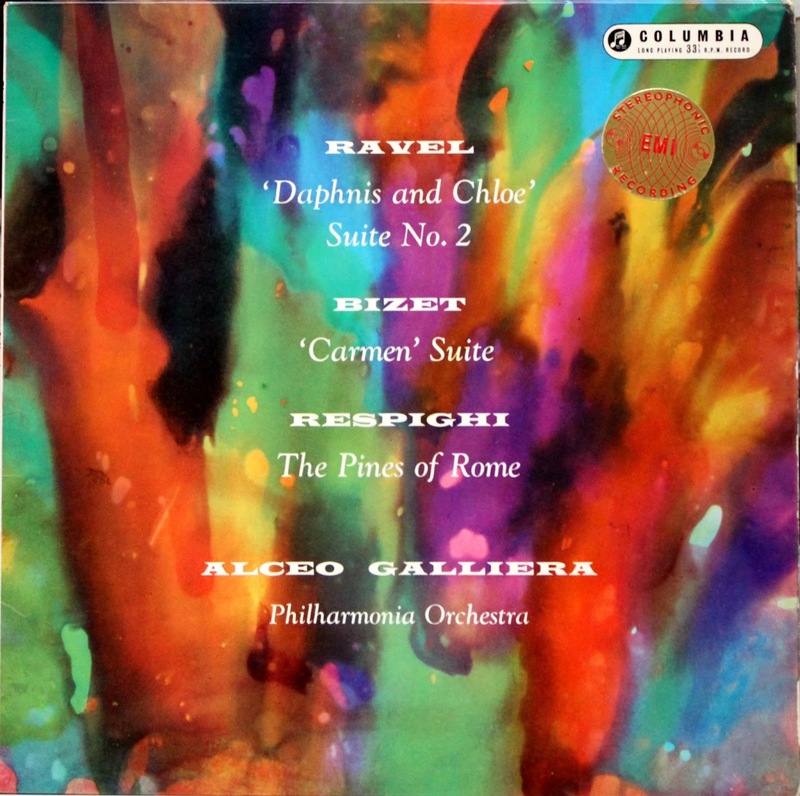 I thought that the sound was a little constricted with regards to sound stage, and dynamic range was okay, not exemplary, with a little bit of distortion in louder passages which was most noticeable in the final movement of the Pines of Rome. Perhaps my colleague who has posted several very interesting observations lately would hear better results on either his or his friend's audiophile system. I have yet to see this reissued on CD. Pines of Rome is a tour de force live. I've got the mofi UHQR of Maazel Cleveland (bought three new). That might be a tall task for a Blue and Silver. The Regal SREG2015 of this Galliera might help and I would think the Classics for Pleasure might give a boost to the dynamic proceedings. I don't think an audiophile system can normally make a silk purse out of a sow's ear, but a remastered LP might have a shot. 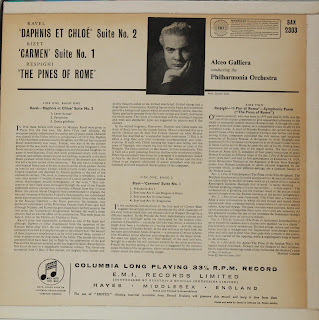 These pieces have stiff competition on records I already have, so I won't pay much to get something that is not at least a top rate performance. No one hold their breath on getting further update from me on this one. I would have to agree with you on this. If Hi-Q Supercut remasters and reissues this, I would consider giving it a try. 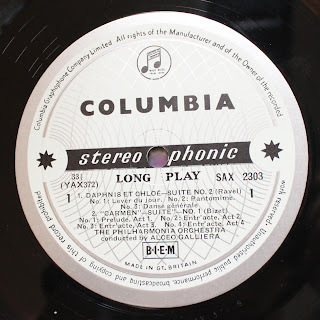 I have a feeling, though this is not yet substantiated by any evidence, that if these modern remastering companies remaster these SAX LPs, the results will likely sound better than many of the originals. Take Electric Recording Company, for instance. I hear they are about to remaster the Kogan Beethoven SAX. That runs in the thousands as a blue/silver. I'd love to hear how that one ends up sounding. I hope it won't run for hundreds, though, as a reissue, but if the Martzy reissues are a point of reference, they might be just as expensive. You have me wondering about these Regals now. I'm curious as to whether they sound any better than the originals. I just had a thought. The 20000 series Concert Classics are quite tubey sounding, but feature no reissues (not until 30000 series). Regal has a lot of pop schlock and then strictly reissues of ASD and SAX mixed in. My hunch is it might have the same pressing sound as the 20000 series. The aforementioned SXLP 20026 Kletzki Scherezade has an interesting sound that is very good, but it does not sound at all like that Toy Symphony SAX. No tracking issues whatsoever with the 20000's I have. They might mate well. Regal's are pretty rare and dealers sense this and try to get obscene prices for them (ditto on SXLP 20026 which is common, but sounds good). I saw some bozo lowering his price on a VG+ SAX today $50 a cycle. He'd come down from $600 to $300. He's getting warmer, but I'd bet he will need to half his price again (mint was $600.) It's called supply and demand and a few sellers will try to get crazy prices beyond Popsike/ebay historical norms. I've seen very few expensive buy it now's sell. It's always the ones with a big bidding war that get top dollar. I suppose dealers have some idea of what will sell in their shop, but times are changing as I would think most buyers are now ebay savvy enough not to pay a large premium at a dealer. Also, I am not seeing semi-circle SAX getting good money over the last year or so. I may not have as many data points for these and the market may be smaller and more fickle for these. I'd have to agree with you about the semi-circle SAXes. The second pressings do not get much money in general. I still think of them as the bargains, because many of the ones I own still sound pretty excellent to my ears. Of course, the semi-circle first pressings (e.g. Szell recordings) fetch plenty. The Buy-It-Now prices on Ebay are downright ridiculous. I typically ignore those unless it is for an album which I know I would never win in a bidding war. I admit, I have used Buy-It-Now to get the David Oistrakh Trio playing the Archduke Trio and also my copy of the Oistrakh/Fournier Brahms Double Concerto. I have made offers to some ebay sellers on other items to get the price down a little. It's been hit or miss. This collecting hobby is just downright expensive, which is why I have settled on my current collection and will most likely not add much more. What I can say is that most dealers will inflate the price. The three main UK dealers I know and have purchased from are Classical Vinyl, Classical Vinyl Records, and Spiral Classics. Of these, the first is the most expensive but typically has the rarest selection. I bought many semi-circles from the second seller for "reasonable" prices, and I was very happy with the quality. I bought some Szells and my Igor Oistrakh Brahms Violin Sonatas album from the third seller. Also has several rare items, some of which are expensive but more reasonably priced than with the other two sellers. If you really want those early pressings, I found that you just have to shop around and keep searching on Ebay until you get it right. There've been times when I paid a lot for an album from a dealer, only to find someone bid and win it for 1/3 the price on Ebay. Very discouraging, but hey, that's life. EMI ASD 279 Album of the Day!